The biggest newcomer of the year is expected to be two way Japanese sensation Shohei Ohtani. 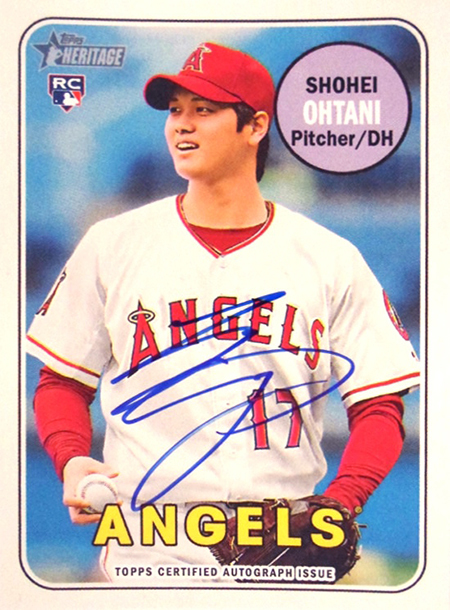 Topps recently announced the Ohtani cards will be found in the soon to be released 2018 Topps Heritage set, but they won't be easily found for the average collector. The autographs will be inserted into both retail and hobby packs, so anyone will have a shot at those although the odds of pulling one are fairly long. There will be a base card short print, however for some reason Topps is only inserting those into hobby boxes. They will not be found in retail packs at all and with the current price of a hobby case at $1300 (almost twice what they were last year), not many average collectors can afford Heritage hobby this year. I guess if you want a card of Ohtani, you will most likely have to go through the secondary market. Another interesting point is that the card will have him as a pitcher as expected, since the Angels are heavily leaning towards not playing him in the outfield at all this season. However, Topps also announced they will put out an Ohtani base card in the 2018 Topps Heritage High Numbers set featuring him as an outfielder. I think his cards will have huge demand up through April. After that, it will depend on how he pitches in the pitcher mashing American League. Will he be more Nomo or more Irabu? That's the problem with collecting Japanese players. They're so hard to figure out and outside of Ichiro, the prices always soften. I've picked up most of my PSA 10 Nomo rookies for under $7 and the majority of his jersey cards for a buck. I hope he ends up being the next big thing from across the Pacific. But if I were a betting man, I'd wait on him. I totally agree, I would wait and see too. In addition to your point, I think right now we would be bidding against some heavy hitter collectors from Japan, so even more competitive than your standard hot rookie bidding.